In the world and especially in the personal development space a lot of people talk about giving and that it is better to be a giver and that you should serve more. You should be a giver? It’s better to give than it is to receive? The more you give, the more you receive? I’m here to tell you that that’s simply crazy. You see, giving is a double edged sword. First of all, if giving is so much better than receiving, the receiver is worse than the giver. And the receiver is bad. Giving is not better than receiving. In fact, sometimes if you give too much and there is not a fair exchange, you will become resented by the people that you are giving to. Secondly, if you only give, you rob the receiver of their accountabilities and in some cases make them feel entitled. They become dependent on your gifts. Look at spoilt brats, who are arrogant and take what they have for granted. I teach at a school and this concept is clearly present there. The students that get everything from their parents – the latest phone, coolest clothes and a lot of pocket money, are often the ones that are the laziest and act like spoiled brats. This is also the case with a lot of charities around the world. They just give food, money and resources to poor countries in need without any accountabilities in return. As a result the people they give too get big families and require even more feeding. So what can we do about it? It’s very simple! 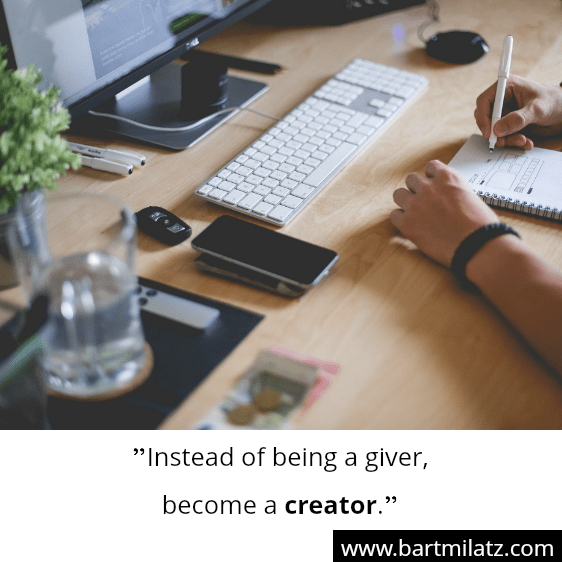 Become a creator instead of a giver. When you create, you transform the resources that you have, such as your time, energy, connections or money into something valuable for someone else. You could create a magic moment for someone, that both you and the other person enjoy. You can create a product or service, and feel the fulfillment of the creation process and the possibilities your product and services have to improve people’s lives. The possibilities of creation are endless and they will help you to fulfill more and to achieve more, instead of just giving and giving. Thank you for reading this article. Now I would love to hear from you! Do you think it is better to give than it is to receive? What are you going to do to become a creator instead? Leave your comments on this page.